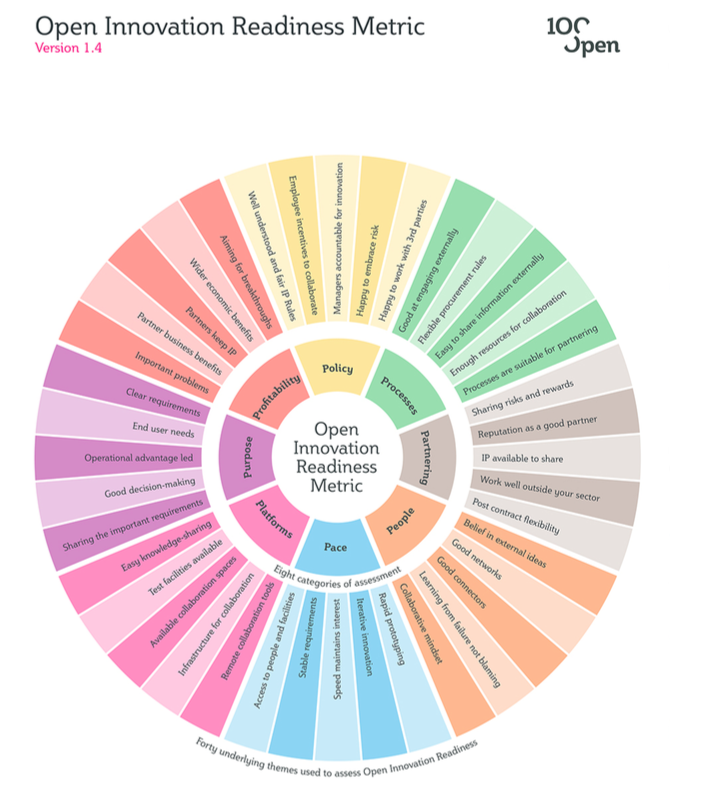 Is your organisation ready for open innovation? We’ve been giving this some thought recently, spurred on by a large public sector client that commissioned us and Aleph Insights to ask this very question. Then the same subject came up whilst we were helping NESTA write its new report called ‘Scaling together – overcoming barriers in corporate-start-up collaboration’. We’ve learned over the years that there are in fact dozens of elements that combine to make a company ready for open innovation. Or not. These are a mixture of cultural, strategic and process factors and their sheer number makes for a daunting To Do list when thinking about innovating in a more open and collaborative way. So we’ve produced a new tool that we are going to launch early in April. It will be able to help people determine the answers to questions like: Do we have the right policies, processes and partners? How about our people, platforms or purpose? We’ve already completed the preparatory work and were able to give our public sector client a complete diagnosis of strengths and weaknesses. And a strategy for how to capitalise on the former and address the latter. What we need now is more data. Wouldn’t it be fascinating to find out how your organisation compares with others? Are you more ready than your competitors? What’s the norm for your sector? We’re looking for a dozen volunteers to take the test and see how their organisation measures up as we build a bigger database. Our ‘get’ is your data. Our ‘give’ is a report that shows you what to do about it. Deal? Please email david@100open.com if so!